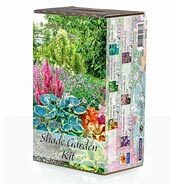 Creating a shade garden is easy with the 30-plant Shade Garden Kit. It contains all the perennials you need to fill a 4'x8' flowerbed. We've selected a mix of plants for added blooms from mid spring to fall. We've also included beloved hostas that are treasured for their texture and color. Whether a beginning or experienced gardener, you'll appreciate how easy it is to grow—as well as how well it fills in and livens up your shaded area. 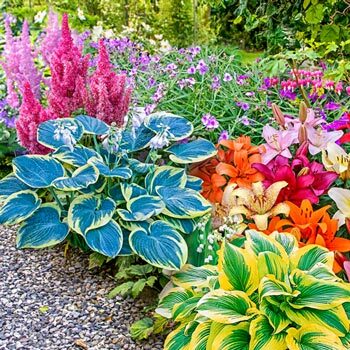 Includes: 8 Asiatic Lilies Mixed, 10 Lily-of-the-Valley, 5 Hostas Mixed, Tradescantia Mix (3 plants) and Astilbe Mix (4 plants). 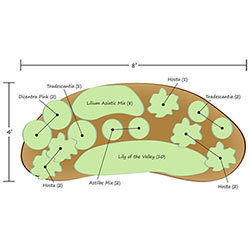 A planting diagram is included in the box. Bloom Time Spring to late summer. Bloom Time: Spring to late summer.